New York – The bicycle sharing program in the city has been blamed for an accident injury after a rider hit a road barrier. The man explains that he was riding the bicycle along the public roadway and approaching a docking station when the front wheel struck the concrete obstruction. He contends that the object was basically hidden from his view due to its common gray color and placement, causing him to crash. The bike crash caused a head injury and subsequent traumatic brain injury, according to reports. The accident victim says that nerve damage in his brain caused him to lose his sense of smell and ability to taste. The man has filed a personal injury lawsuit due to claims of negligence in the installation and maintenance of the barrier. Inspection of the accident scene shows that the stumbling block has now been painted orange with a traffic cone placed nearby to warn pedestrians and bicyclists of the dangerous situation. Some have pointed out that the obstacle should have been clearly marked at the time of installation in order to prevent just such a bicycle collision or trip and fall accident. They say that these types of hazards should have been picked up on by bike sharing program organizers before someone got hurt in an accident. The road hazard was placed right next to a cross walk, where pedestrians and bike riders would expect to be able to ride or walk safely. Further investigation is necessary to determine who is responsible for the proper installation and maintenance of these road barriers. Find out more about the accident in this article. New York – Witnesses report that a bicyclist was hit by a garbage truck in Brooklyn, NY a few days ago. The truck accident crushed the bicycle underneath its front end and injured the cyclist. Specifics of the accident victim’s injuries were unknown but evidence shows that he suffered at least a leg injury during the crash. Trauma specialists note that bicycle accidents can be quite severe, leaving the injured person with broken bones, neck and back injuries and head injury. They explain that even with the use of a helmet, a bicycle crash can cause a traumatic brain injury and death. 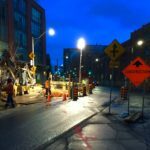 Internal injuries and fractures are even more likely and serious when the injury involves a garbage truck accident. Just before the weekend another bicyclist was hit by a garbage truck and was killed. Several New York traffic and bicycle safety laws are in place to try to prevent accidents, injuries and death. Advocates say that the next step is for police and the courts to enforce those laws in order to truly protect citizens. Some have contended that many of the rules and regulations have been ignored, leading to a dangerous situation that puts everyone at risk. They warn that illegally parked cars, trash left in city bicycle lanes and aggressive or even reckless drivers have been ignored by law enforcement officials. Awareness programs are also sorely needed to educate citizens about their rights in case they were injured in an accident. Experts explain that the most basic right is to speak to an experienced injury attorney about your case. Read more about bicycle crashes, safety and statistics here. New York — Earlier today a bicycle crash in Brooklyn claimed yet another accident victim’s life. Bystanders believe that a truck driver was at-fault for the dangerous collision when he was speeding and turned into the bicyclist. The flatbed tow-truck driver reportedly stopped at the accident scene for a few moments but then got back into his vehicle and fled before witnesses could stop him. The hit-and-run accident left the injured victim in critical condition and emergency services were called by local residents. The man died on the street while waiting for the ambulance to arrive according to his family. 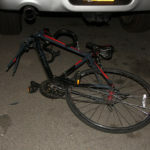 According to analysts, this crash was yet another bicycle collision the growing list that have been occurring in the busy city. Some believe that reckless drivers will cause even more accidents as the New York City bike share program puts even more cyclists in harm’s way. Some observers have warned that the program hasn’t done enough to prevent injuries, such as providing easily accessible helmets or proper warnings about the dangers of riding on city roads. A man was hit by an SUV cab driver when riding a shared bicycle only three days after the program debuted. Traffic safety experts say that one of the major problems is that drivers don’t safely share the streets with pedestrians, bicycles or even other cars. They say that drivers are often distracted by cell phones and texting or they are speeding and weaving through traffic dangerously. The alleged hit-and-run truck driver from today’s bicycle accident was found and arrested within hours of the incident. Criminal charges as well as a likely wrongful death lawsuit are pending. A video and updated article about this crash is available here. New York — A driver plowed his car into a sidewalk in the East Village section of Manhattan this past week. Reports indicate that at least four crash victims, including several store workers, were treated for multiple injuries from the accident. Bystanders in the area indicated that the car accident scene left injured people and debris scattered with emergency rescuers struggling to take care of the wounded. The pedestrians and one bicyclist were stabilized on the scene and taken by ambulance to city emergency rooms for treatment. Police report that the driver of the car that caused the pedestrian accident was arrested on suspicion of driving under the influence of alcohol and/or drugs. They noted that the driver has a record of drunk driving or driving while impaired by drugs in the past. No obvious cause for the car crash has been reported, as the roads were clear and no other vehicles were involved. Pedestrian safety advocates in New York explain that drivers need to be much more careful in order to avoid hurting or killing innocent people walking or riding their bicycles. Another pedestrian accident occurred on Long Island, NY over the weekend. That collision left a family, including three children injured, when the driver hit them with his SUV. Police did not indicate that they believed the driver was drunk or otherwise impaired. Some people familiar with the accident think that the man was a distracted driver. Overall, safety activists are concerned that motor vehicle accidents are becoming more common and more deadly in New York City. A top accident lawyer warns that drivers need to be more attentive to their driving and avoid the commonplace distractions that are often associated with dangerous driving. This can include driving while on the cell phone, texting or sending emails while driving and even watching videos and eating while behind the wheel. To find out more about the growing list of injuries and deaths from car accidents in New York City, check out this article. Current research into concussion due to a head injury shows that the victim is much more likely to suffer in the future with degenerative brain problems. Medical research for centuries has acknowledged that head trauma victims commonly suffer with chronic memory loss and other cognitive injuries. However, this latest study shows that a concussion injury patient can also develop dementia or other degenerative brain disorders due to structural damage to the brain. This can leave the person who was hurt in an accident permanently disabled. Common causes of a concussion, also referred to as a mild traumatic brain injury, include a car crash, construction accident, pedestrian hit by a car or even a slip and fall accident. Some citizen activists as well as concerned doctors note that a new bicycle sharing program in New York City may lead to more head injuries and concussions. They have leveled concerns that the city should provide helmets when riders are using their bicycles in order to prevent more debilitating brain injuries. Accident specialist explain that a bicycle accident leaves the victim at significantly increased risk of injury or death due to lack of safety technology as would be found in a car. When a bicyclist is hit by a car, the wounded rider can be crushed by the car or even thrown into the air for several feet. The injury risk is even greater when the accident involves a bus or truck, as are commonly found on the streets of metropolitan New York. Some believe this is a significant liability and could constitute negligence if the administrators of the program know that riders don’t have reasonable access to safety equipment such as a helmet. They warn that making bicycles more accessible to the public comes with increased responsibility for their safety. Check out more on the latest research into post-concussion injuries here.